Hanoi (VNA) – Up to 1,468 out of 2,112 dengue fever hotbeds have been put under control in the capital city of Hanoi. The rate of the disease hotbeds that are yet to record new cases after two weeks accounts for 69.5 percent and most of them have fewer than five patients. All 584 communes in 30 districts and townships formed 26,038 voluntary groups with the involvement of 63,119 people, who sought to exterminate mosquito larvae and 4,638 inspection groups with 10,095 taking part. The city launched 90 large-scale chemical spraying campaigns and over 1,000 environment hygiene drives. The rate of households being sprayed in high-risk areas amounted to 86 percent. Apart from the State funding assigned early this year, the municipal authorities continued providing additional funding for the dengue fever prevention campaign in the city. 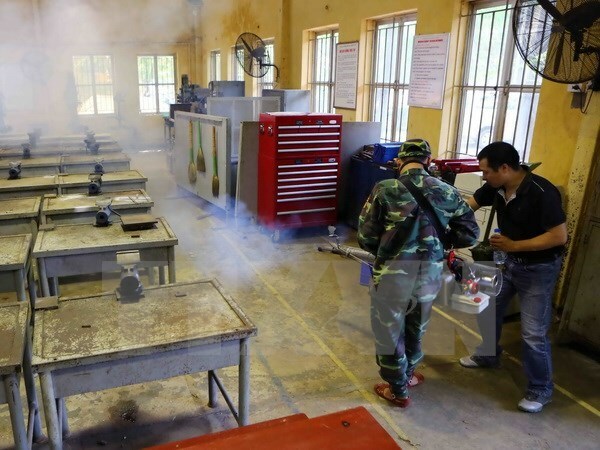 The Health Ministry directed northern cities and provinces to deploy 20 large-capacity spraying machines and providing more anti-mosquito chemicals for Hanoi, and assigned four expert teams with six members each to increase manpower for the effort. In the near future, the number of dengue fever cases is forecast to increase due to humid and rain weather conditions. Since early this year, as many as 100,417 dengue fever cases have been reported nationwide, a rise of 47.9 percent year on year, with 26 deaths, nine more than the same period last year.